An implant overdenture requires an adequate amount of three-dimensional space for accommodating implant superstructures/attachments to enhance retention and stability. In edentulous patients, this space is bounded by the proposed occlusal plane, denture bearing tissues of the edentulous jaw, facial tissues (cheeks and lips), and the tongue. Lack of space can result in fracture of the acrylic resin, esthetic problems, and other technical problems. Various techniques can be employed during the diagnosis and treatment planning phase, to assess and accurately, calculate the available interarch distance at the correct vertical dimension of occlusion. These include (a) Assessment of properly articulated diagnostic or master casts, (b) diagnostic wax-up of the planned prostheses, and (c) evaluation of existing interim or immediate conventional dentures. For designing mandibular overdentures, the anterior mandible can be divided into five positions (from left first premolar to right first premolar), namely A, B, C, D, and E.  Implants are placed in these positions depending upon the arch size, jaw relation, interforaminal distance (IFD), and the available vertical restorative space (AVRS). 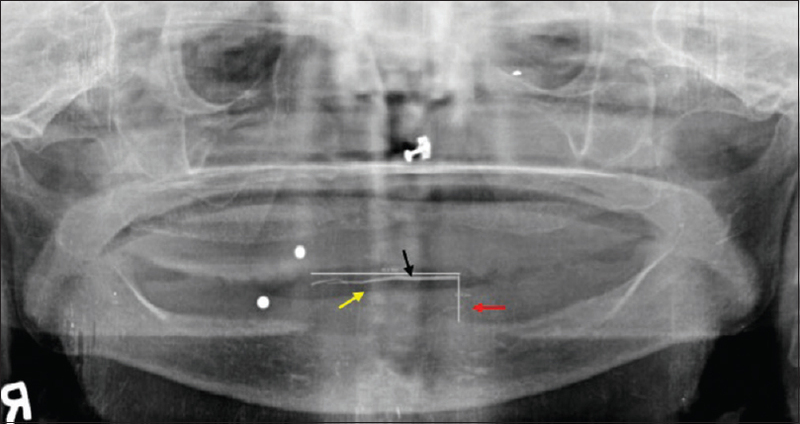 For the placement of five implants with a minimum diameter of 3.3 mm in the mandibular interforaminal region, the space requirement for five implants needs to be approximately 44.5-48.5 mm [Figure 1], i.e., a 2 mm safe space from mental foramina; further, sometimes if there is a loop of inferior alveolar nerve, then additional 2 mm is needed as a safety distance from the mental nerve (4 mm); if a bar clip is to be placed, an interimplant distance of 6 mm is required for the clip accommodation, similarly for a bar superstructure with clips, the vertical space requirement is at least 15 mm from the alveolar crest [Figure 2]. 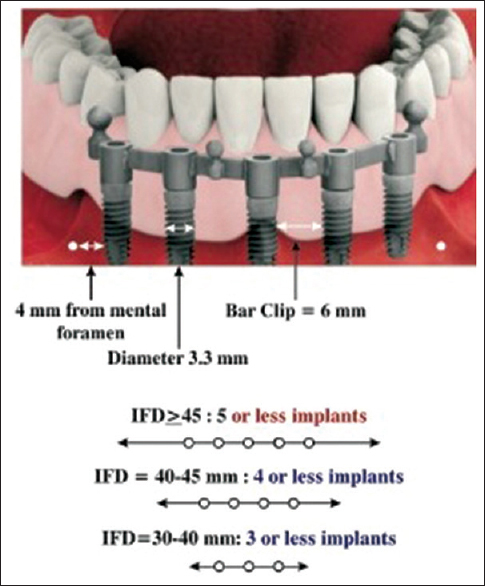 With this aforementioned in mind, the aim of the present study was to calculate the IFD and vertical space availability and devise a classification system based on the AVRS and IFD for establishing guidelines in the treatment planning of edentulous mandible, to aid in selection of implant size, number, and position along with the associated prosthetic design [Table 1]. Ethical approval for the study was granted by the Dental College and Hospital Institutional Ethical Committee. Three hundred edentulous subjects were studied, and complete denture of these patients were fabricated. Based upon the jaw relation, they were further segregated into Class I (45%), Class II (31%), and Class III (24%). Out of each class, 10 patients were randomly selected for the study, who fulfilled the inclusion criteria (completely edentulous patients between age group of 50 and 65 years, edentulous span of 6 months to 1 years, first time denture wearer, and nonsmoker) and exclusion criteria (the subjects with any systemic disease related to bone metabolism and on medication effecting bone turnover were excluded). 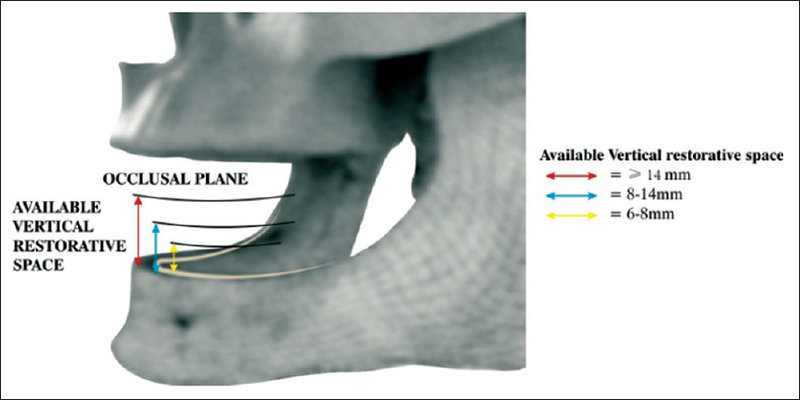 In each edentulous subject, jaw relation and type of mandibular arch form were analyzed and recorded during the fabrication of complete denture. Radio-opaque material, i.e., gutta-percha points were attached on incisal surface of the mandibular acrylic teeth from the distal surface of left mandibular canine to right canine. Two ball bearing of 3 mm diameter were placed on upper and lower denture, to check the magnification error and the relative error was neutralized for each case [Figure 3]. The patients were asked to wear a prosthesis, and panoramic radiographs were obtained (Planmeca Proline (EC), Model No. 00880, Helsinki Finland, 2002). Images were recorded using the radiographic digital screen, which was later digitalized by placing in the Vista scanner (VistaScan Combi+, Model No. D74321, Biegheim-Bissingen, 2007). Image Tool computer programming was used to calculate the radio-opaque markings. The horizontal distance (IFD) and vertical space values i.e., from the crest of mandibular residual alveolar ridge to the proposed occlusal plane were calculated with the help of a two-dimensional digitized measuring tool provided in Vista software (Vistascan Combi+, Model no. D74321, Biegheim Bissingen, 2007) [Figure 4], the radiographic errors were standardized. Values were then computed and statistically analyzed. Jaw relation and type of mandibular arch form was analyzed and recorded. Descriptive statistics was calculated for each group. The results were subjected to one-way analysis of variance (ANOVA) and two-way ANOVA statistical analysis with a significance level of P < 0.05. [Table 2] shows the mean and standard deviation of IFD (horizontal) and the vertical space in Class I, Class II, and Class III jaw relation patients are 38.9 ± 4.5 mm and 13.69 ± 0.9 mm, respectively. 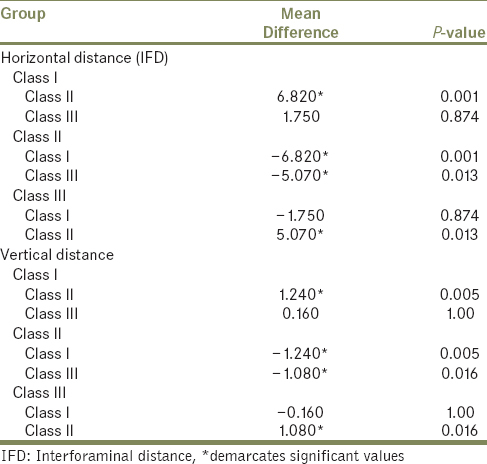 [Table 3] shows the comparison of horizontal and vertical distance between Class I, Class II, and Class III jaw relation in 30 edentulous patients. Comparison of mean between these groups depicts that the value of horizontal distance and vertical space is more in Class I than Class II (P = 0.001 and P = 0.005, respectively), and value of horizontal distance and vertical space in Class III is more than Class II (P = 0.013 and P = 0.016, respectively). However, there is no clinically significant difference in the values of horizontal distance and vertical space among Class I and Class III (P = 0.87 and P = 1.00, respectively). 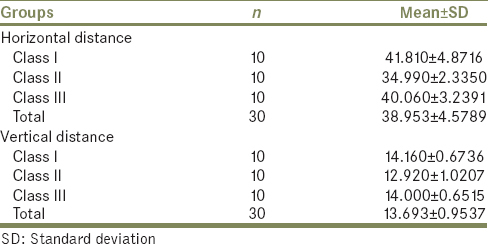 [Table 4] shows the correlation of interforaminal (horizontal) distance and vertical distance in Class I, Class II, and Class III jaw relation with different arch form, the mean of square arch form was on higher side, but it was statistically insignificant (P > 0.05). Implant supported/retained mandibular overdentures have 3 crucial components: The implant fixtures (two or more), the choice of attachment (bars, studs, or magnets), and the prosthesis. Looking at the above literature, it becomes increasingly important to give added consideration in the treatment planning phase of implant supported/retained mandibular prosthesis. The individual anatomic variations in the patients should be respected, and the treatment plan regarding the number of implants and choice of superstructure should be based upon the same. Considering the above data and varied intraoral situations, a classification system is developed based on IFD and AVRS [Table 1]. Ahuja and Cagna  proposed a classification considering the vertical space as a decisive parameter for attachment selection. However, the classification has not considered the IFD. The classification system presented here suggests the size, number, and position of implants to be placed with the associated prosthetic designs. Once established, it would facilitate the conceptualization of available space in the patient and associated treatment modalities. Class Ib, wherein IFD is in the range of 30-40 mm and AVRS is ≥14 mm. While designing the prosthesis for Class Ib, an option of four or fewer implants could be used with bar and clip attachments or ball and locators attachments. Class IIb, wherein IFD ≤30 mm and AVRS is between 8 and 14 mm. For Class IIb, an option of two could be used with ball and stud type when designing the prosthesis. Class IIIb, wherein IFD ≤30 mm and AVRS is between 6 and 8 mm. For Class IIIb, an option of two could be used with locator type of attachments when designing the prosthesis. The deciding factor for rehabilitating the edentulous patients with implant supported mandibular overdenture is interforaminal space; however, the final selection is modified by AVRS. The article proposes a simple classification system based on the AVRS and IFD, for establishing the guidelines in the treatment planning of the edentulous mandible, to aid in selection of implant size, number, and position along with the associated prosthetic design. Zarb GA, Schmitt A. The edentulous predicament. I: A prospective study of the effectiveness of implant-supported fixed prostheses. J Am Dent Assoc 1996;127:59-65. Misch CE. Dental Implant Prosthetics. II nd ed., Vol. 58. U.S.A: Elsevier Mosby; 2005. p. 130-40. Berglundh T, Persson L, Klinge B. A systematic review of the incidence of biological and technical complications in implant dentistry reported in prospective longitudinal studies of at least 5 years. J Clin Periodontol 2002;29 Suppl 3:197-212. Heckmann SM, Schrott A, Graef F, Wichmann MG, Weber HP. Mandibular two-implant telescopic overdentures. Clin Oral Implants Res 2004;15:560-9. Eitner S, Schlegel A, Emeka N, Holst S, Will J, Hamel J. Comparing bar and double-crown attachments in implant-retained prosthetic reconstruction: A follow-up investigation. Clin Oral Implants Res 2008;19:530-7. Chung KH, Chung CY, Cagna DR, Cronin RJ Jr. Retention characteristics of attachment systems for implant overdentures. J Prosthodont 2004;13:221-6. Sadowsky SJ, Caputo AA. Effect of anchorage systems and extension base contact on load transfer with mandibular implant-retained overdentures. J Prosthet Dent 2000;84:327-34. Goodacre CJ, Bernal G, Rungcharassaeng K, Kan JY. Clinical complications with implants and implant prostheses. J Prosthet Dent 2003;90:121-32. Ahuja S, Cagna DR. Classification and management of restorative space in edentulous implant overdenture patients. J Prosthet Dent 2011;105:332-7.